JL Fields, of JL Goes Vegan, is letting me share her recipe for Mac and Cheese with Soy Curls from her book, Vegan Pressure Cooking. I don’t have a stove-top pressure cooker, but this came out great in my Instant Pot. It reminds me of a faux chicken casserole only with pasta in place of rice. You could use this recipe as a jumping off point. Next time I’m going to turn it into a South of the Border dish with some beans, green peppers, tomatoes, chili powder and maybe even some green chilies or jalapenos. Let me go back a bit and explain what soy curls are and where you can get them. They are a dehydrated soy product made of non-GMO soybeans. 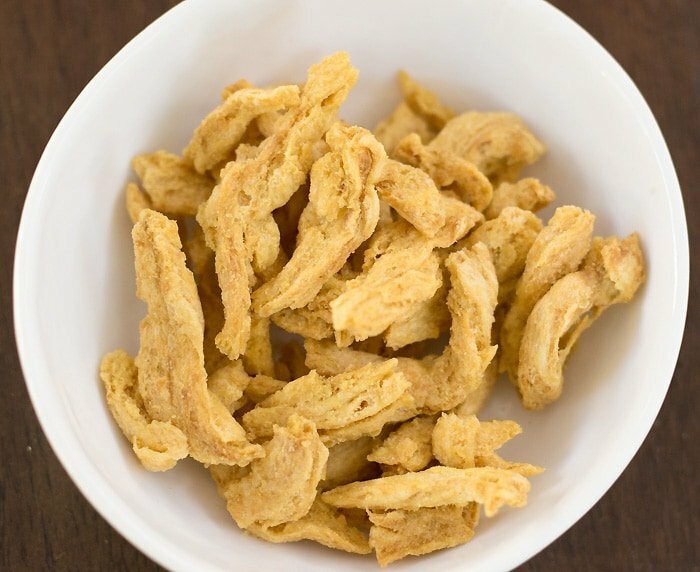 While they look a lot like TVP they are made with the whole soybean and tvp is made from defatted soy flour. You can always buy them on Amazon, but you can also order them from the Soy Curl website, or find out if they are in your area from the Butler Soy Curl website. You can see them rehydrated above. They are great in a bbq sauce, mixed in pasta or used in your favorite childhood casserole. I usually chop them up a bit because they are too long to be bite-sized. I mostly followed the recipe, but I did add 1 teaspoon of a chili powder blend and 1/2 teaspoon smoked paprika. I love a little smoky flavor! 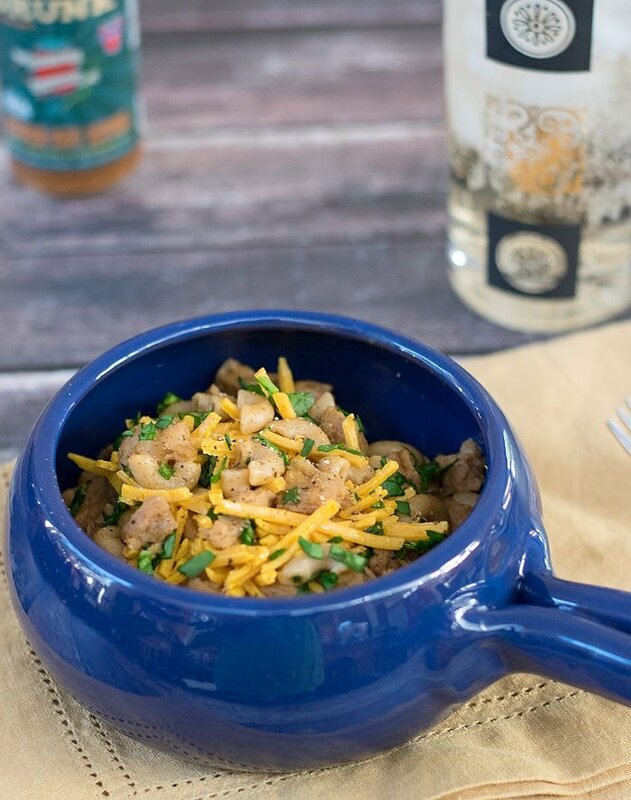 This easy and comforting dinner is a snap to make. Plus it's a one pot meal your whole family can get behind. This recipe is from JL Field's wonderful book, Vegan Pressure Cooking from Fair Winds Press. 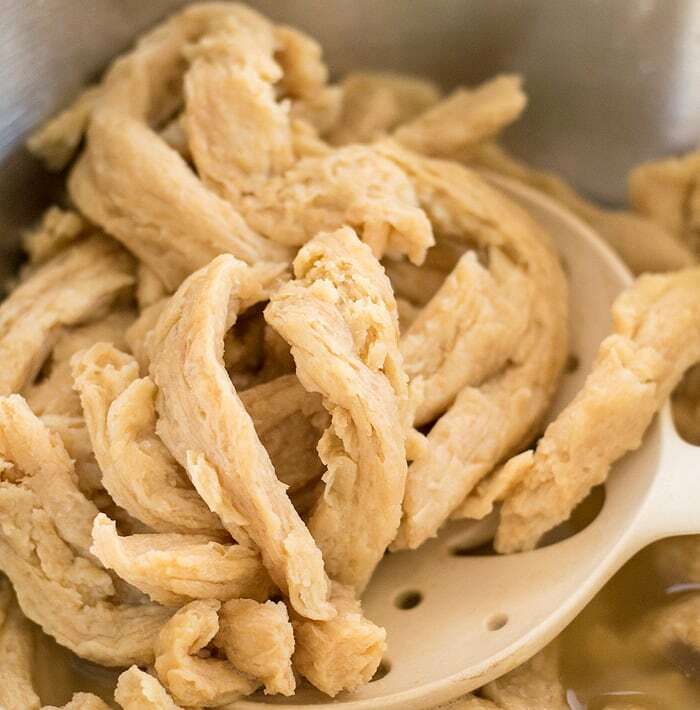 Place Soy Curls in a container large enough to cover with warm water and soak for 8-10 minutes to re-hydrate then drain excess water. Heat vegan butter on medium-high heat in an uncovered pressure cooker. Stir in Soy Curls and Chik-Style seasoning and sauté for about five minutes. Add pasta, the remaining 2 cups of cool water (or as needed enough to cover the pasta), stir, add nutritional yeast, stir well, pat down the soy curls and cover the pressure cooker. Cook at low pressure for five minutes. Use a quick release method. Uncover, stir and taste. Stir in optional vegan cheese and/or salt and ground black pepper. Let sit for about five minutes before serving. I’ve never heard of soy curls. I’ll have to check them out. This looks like a great meatless dinner. 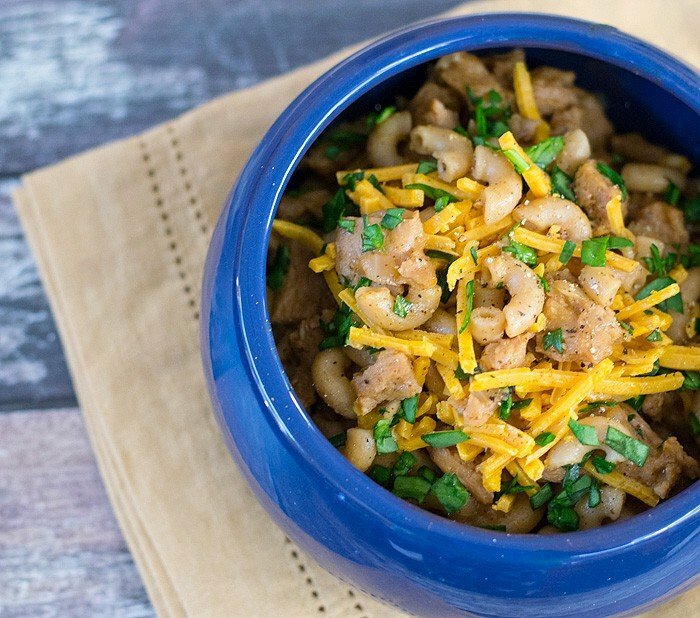 Fantastic spin on mac n cheese! never heard before of sox curls! Thank you for introducing me to something new! 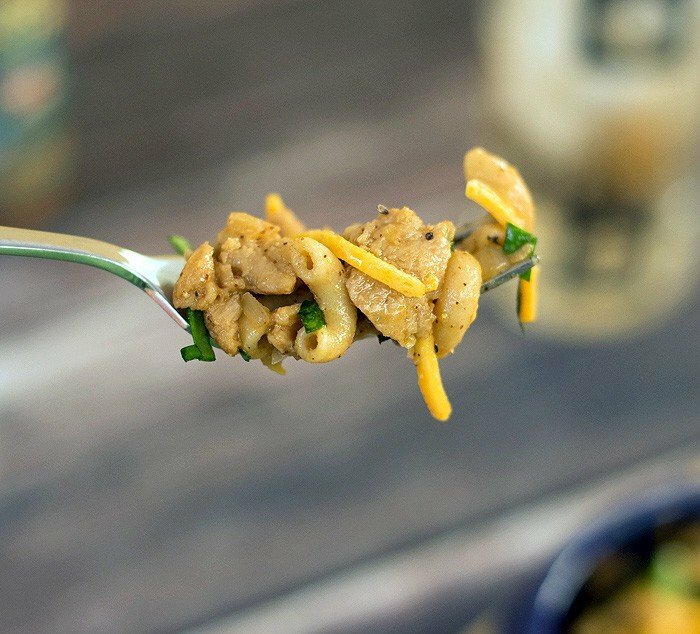 I’ve heard so much about soy curls lately and am enjoying seeing different ways people are using them. This is a great twist on an old favorite! And, I’m still fascinated by the Instant Pot. Thanks for explaining what an instant pot is! I’ve heard about them, but didn’t realize they’re like a pressure cooker. Such and interesting recipe — sounds delicious! 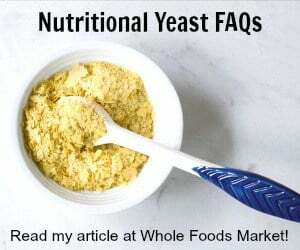 Nutritional yeast is such a magical ingredient isn’t it?! I haven’t seen soy curls in the store yet. I will need to keep my eyes open next time. I’m sorry you weren’t fond of this. How can something so easy taste so good? Thanks for sharing this! When you say bring to pressure then cook at low pressure for 5 minutes.. how do i set the Instantpot to do that? Normally I choose manual then set time. Is that what you mean? I used organic rice pasta and it turned out great! Really unattractive, but very yummy! I made this and it turned out really well despite a bunch of little substitutions (no fresh garlic, normal pasta, altered seasoning based on what I had). It did come out a little watery but I just put saute mode back on until I cooked off the excess water.